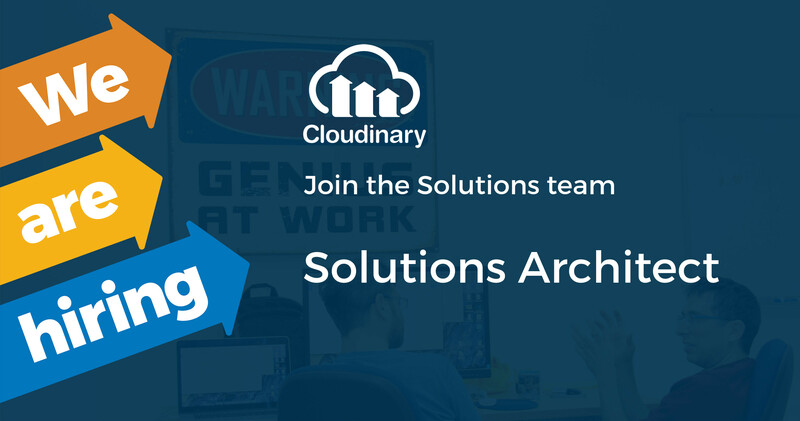 Cloudinary is looking for an experienced Solution Architect to join its Enterprise Solutions team. Join our team and you’ll have the opportunity to work on challenging and diverse software development projects with Fortune 500 enterprises and Unicorn Startups. In this role, you will be able to impact and influence future product developments, create and maintain powerful long lasting relationships with Cloudinary’s enterprise customers, and take a crucial part in the company’s success. Consulting, training, responding to pre-sales escalations, and post-sales Professional Services for Cloudinary’s Enterprise customers (F500 companies and Unicorn startups). Quickly understand customer’s complex systems and requirements and find the correct solution for their needs. Background in web development, media delivery, content distribution, information technology, information security, and a basic training as software or system engineer. This is a 100% customer-facing job. You should love and excel at interacting with customers, training and consulting. Bachelor or Master’s degree in information technology / computer science. 5+ experience years as Solutions Architect, Enterprise Architect or Professional Services engineering, with content or media infrastructure companies. Deep knowledge and experience with web technologies, including Security, Performance, and different web development platforms. Experience in understanding Enterprise customers and their needs. Able and eager to travel 25% to customer sites, in EU and APAC. Partial remote work is possible. Are you a fun, talented and experienced individual? Do you have an entrepreneurial spirit and passion for cutting-edge technologies? if so, come join us! Check out our job openings.